The holiday is commonly printed as Veteran's Day or Veterans' Day in calendars and advertisements. While these spellings are grammatically acceptable, the United States government has declared that the attributive (no apostrophe) rather than the possessive case is the official spelling. In 1953, an Emporia, Kansas shoe store owner named Al King had the idea to expand Armistice Day to celebrate all veterans, not just those who served in World War I. King had been actively involved with the American War Dads during World War II. He began a campaign to turn Armistice Day into "All" Veterans Day. The Emporia Chamber of Commerce took up the cause after determining that 90% of Emporia merchants as well as the Board of Education supported closing their doors on November 11, 1953, to honor veterans. With the help of then-U.S. Rep. Ed Rees, also from Emporia, a bill for the holiday was pushed through Congress. President Dwight Eisenhower signed it into law on May 26, 1954. Congress amended this act on November 8, 1954, replacing "Armistice" with Veterans, and it has been known as Veterans Day since. 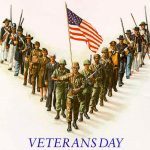 Although originally scheduled for celebration on November 11 of every year, starting in 1971 in accordance with the Uniform Monday Holiday Act, Veterans Day was moved to the fourth Monday of October. In 1978 it was moved back to its original celebration on November 11 (with the exceptions described above). © 2017 The American Luxembourg Society. All Rights Reserved.